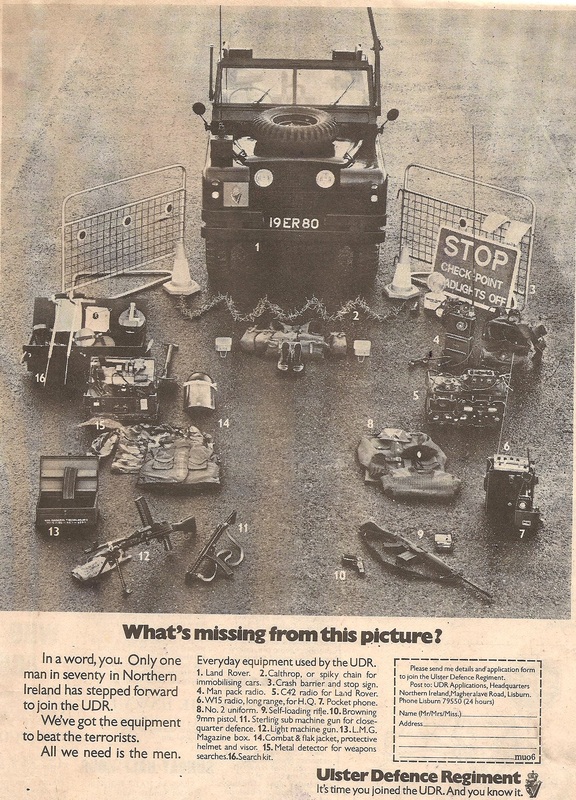 A Recruitment ad for the now disbanded UDR (Ulster Defence Regiment). 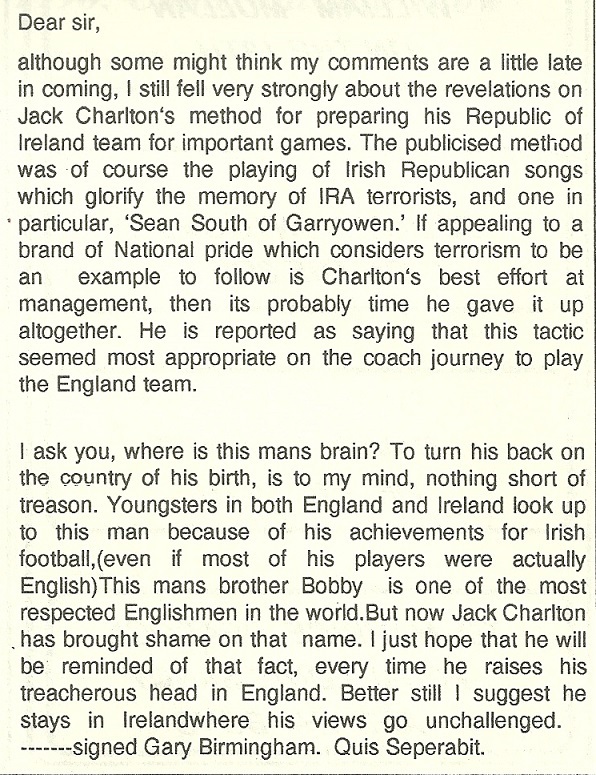 From the 1979 Westminster Elections a leaflet for Sean Farren of the SDLP running in North Antrim. Powersharing is amongst the items covered. Sean Farren who was until recently a leading figure in the SDLP. As images are difficult to read the text of each image is below. 1,221 votes (3.22%) and lost his deposit. Problem of course being that it may now be the DUP who have that say. 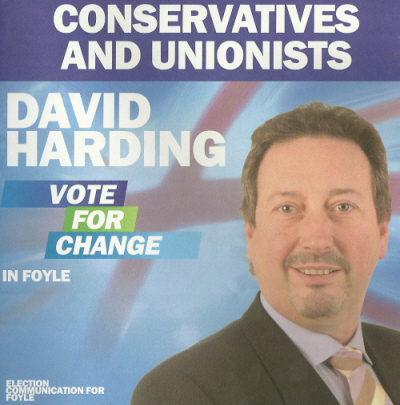 Harding is pictured all over Derry with a grey haired lady, anyone know who she is? A Yes to the Good Friday Agreement flyer produced by The Progressive Unionist Party (PUP) in 1998. The PUP were seen as the political wing of the UVF so their approval (along with that of the UDP) was seen as vital for the passing of the Referendum in May 1998. Many thanks to the donor. 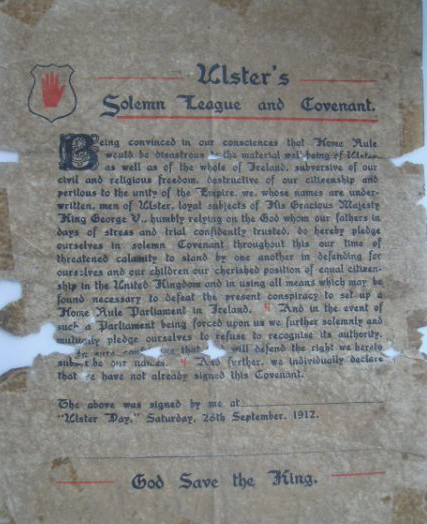 From 1912 an original copy of ‘Ulster’s Solemn League and Covenant’ sent in by a kind donor who writes….. This is not election literature but very political nevertheless and probably one of the most important documents of the 20th century. In fact, it’s probably the Unionist equivalent of the Proclamation. It’s ‘Ulster’s Solemn League and Covenant’ known as ‘The Covenant’ from 1912. Many of the most ardent opponents of Home Rule were said to have signed it in their own blood, not the only blood spilled over that bill. Being convinced in our consciences that Home Rule would be disastrous to the material well-being of Ulster as well as of the whole of Ireland, subversive of our civil and religious freedom, destructive of our citizenship and perilous to the unity of the Empire, we, whose names are underwritten, men of Ulster, loyal subjects of his Gracious Majesty King George V, humbly relying on the God whom our fathers in days of stress and trial confidently trusted, do hereby pledge ourselves in solemn Covenant throughout this our time of threatened calamity to stand by one another in defending for ourselves and our children our cherished position of equal citizenship in the United Kingdom and in using all means which may be found necessary to defeat the present conspiracy to set up a Home Rule Parliament in Ireland. And in the event of such a Parliament being forced upon us we further solemnly and mutually pledge ourselves to refuse to recognise its authority. In sure confidence that God will defend the right we hereto subscribe our names. And further, we individually declare that we have not already signed this Covenant. Ulster Day, Saturday 28th, September, 1912.